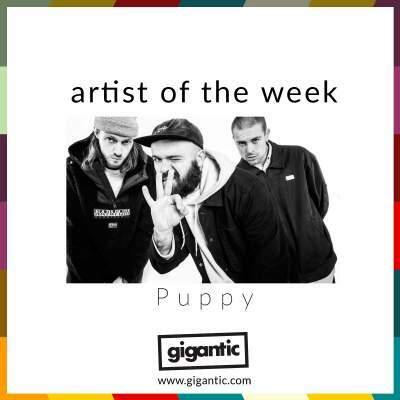 Bringing together melodic heavy rock, grunge vibes and huge pop hooks, Puppy are the band looking to become the new face of British metal. With the release of their debut album ‘The Goat’, they are attracting a huge amount of attention amongst the critics who are loving their expertly crafted songs and feel good attitude. “Rising Brit stars Puppy prove they have bite on full-length debut The Goat” – Kerrang! Puppy formed in 2014 after drummer Billy Howard and vocalist / guitarists Jock Norton’s previous project Poltergeist gave up the ghost. Whereas their previous work had been centred around a lo-fi sound, the pair were ready to embrace something a bit more polished to take their love of heavy rock even further. Recruiting Will Michael on bass, the trio released their debut single ‘Forever’ the following year. Fusing elements of grunge and melodic metal, the song has massive slacker appeal and sounded much more like a truly established act rather than a band first getting started. ‘Forever’ would be accompanied with a promo video which stole footage from looks like a massive US outdoor rock concert in the 90’s passing it off on their own. This combination of nostalgia and witty gimmicks for their videos would become a central characteristic for the London based band and helped them grab immediate attention from a wide selection of the most discerning online music press. Striking whilst the iron was hot, the boys were soon back with second single ‘The Great Beyond’ which is a four and a half minutes of huge riffs. This time round, the video starred famed actor Metin Marlow as a crooning karaoke singer who they would later recruit for their send up of classic kids TV fantasy gameshow Knightmare for ‘Arabella’ in 2017. ‘Forever’ and ‘The Great Beyond’ would feature on their eponymously titled EP which proved the huge creative talents the band possessed. Both singles would also be snatched up by Activision for their hit video game Guitar Hero Live. The next release for Puppy was the crushing single ‘Entombed’ which was their hardest recorded song yet. It would signify the direction they were heading in on for their second EP ‘Vol. II’ which would be their most ambitious and accomplished record to that date, comprising of six killer tracks. After dropping a series of singles including the satisfyingly muscular track ‘Black Hole’, bass led ‘World Stands Still’, the epic ‘Bathe In Blood’ and sinister sounding ‘Poor Me’; Puppy had succeeded in getting everyone excited for the release of their debut album ‘The Goat’ which came out in January of 2019 through Spinefarm Records. Building on their knack for combing huge riffs with pop sensibilities while touching on a range of alternative genres, their first full length is a masterclass in melody and how to create a truly satisfying record which makes for addictive listening. Last year saw Puppy hit the road on their very first headline tour which was highly successful. They are back in the van this week to play all around the UK to promote ‘The Goat’. Tickets are selling fast, so make sure you grab yours before they are all gone! Puppy tickets are currently available.